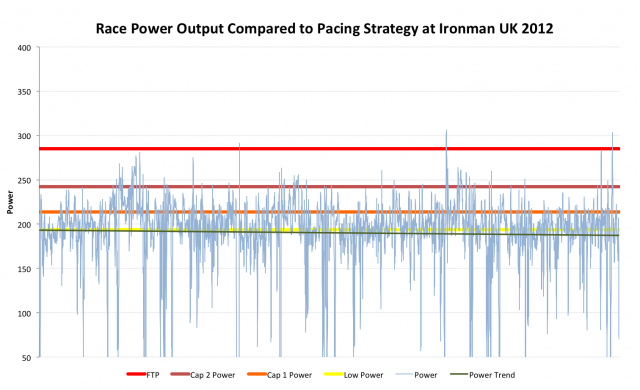 Here’s an interesting case study: one of my athletes, racing at Ironman UK, all going well, until just over halfway through the marathon he starts to slow. Must have biked too hard, right? That’s the obvious conclusion. More often than not, when I review data from an Ironman in which an athlete suffered in the run, I find pacing errors on the bike and when I don’t the next logical conclusion is a nutritional mistake. I, and many other websites, frequently espouse the view that the bike is critical to successful Ironman running and I support this in my training programs with the emphasis tending to be on bike fitness. But my athlete didn’t bike too hard, and thanks to his near compulsive levels of data recording I can be confident he ate more than enough. What happened? We can start with the swim as, unusually, I have data. If there is one benefit to the Polar system it can record heart rate during the swim; I may not get unreliable GPS plots or stroke counts, but I have some measure of effort. The athlete in question has a strong swim background, to the point that when we first worked together it was a neglected area of training, that changed this year as we concluded that while he could swim up front without much training, it came at a high cost early in a race. Since then he’s increased his swim volume and also made greater efforts to hold back during the swim portion of the race. 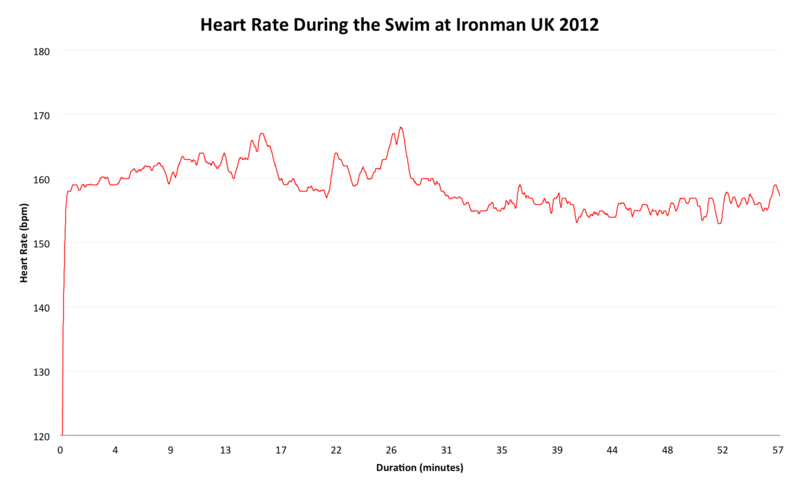 As the graph below shows, he did go out a touch hard, but had the presence of mind to bring this under control and have what he described as his easiest Ironman swim ever. Perhaps there was room to ease back further for a lower HR, but it’s hard to tell the impact this would have had on his race, recent analysis of Roth results showed how relatively weak the correlation between swim and run performance was. We’d developed a clear power-based plan for the bike, using two caps thoroughly practiced and determined in training. Power has been a revelation for this athlete, since investing he has completely eliminated any tendency to surge and learned to control his racing in a narrow band of effort. 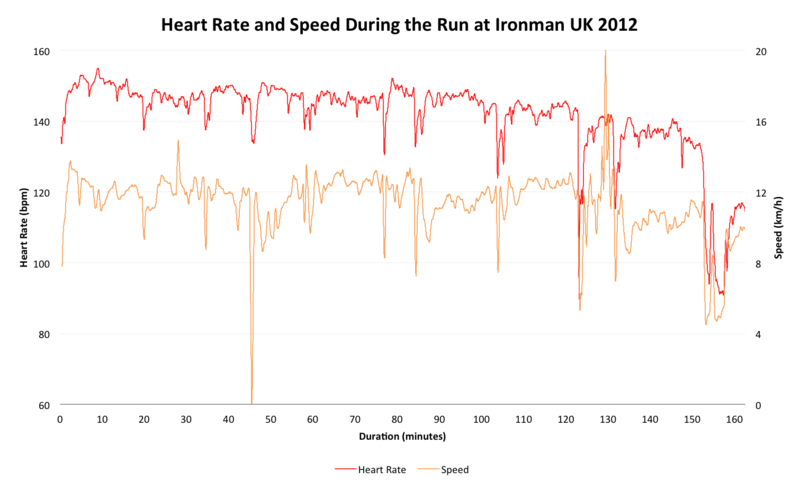 As the graph below shows he did a superb job of pacing, if anything given his FTP he could have gone harder. The bike was described as comfortable, and with an intensity factor (IF) around 0.69 it should have been. At this point we should consider nutrition. In planning this race I had questioned the athlete’s strategy – he was proposing an unusually high intake of food, easily at or above the 90g/hour peak absorption level I’ve previously referred to. Again this had been tested in racing and training, his nutrition at Wimbleball has been at a level above what I would use in an Ironman and caused no issues at the higher intensity of work. 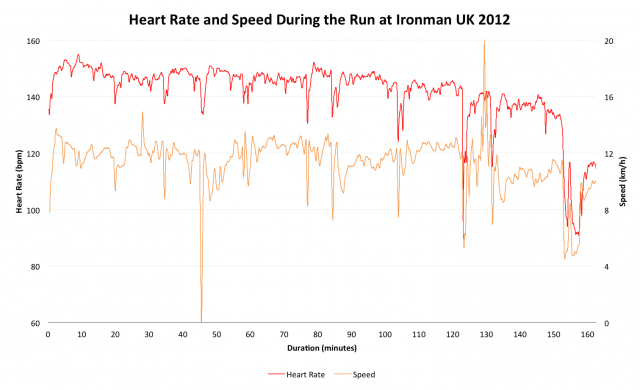 At Ironman UK he consumed a combination of gels and bars that should deliver between 400 and 500 calories per hour, and no, he didn’t experience GI distress at any point in the day. Fluid and nutritional intake doesn’t seem to have been the source of any problems, and yet two hours into the run things went wrong. If there’s a downside to the Polar system it’s a limited amount of memory, meaning thirty kilometres through the marathon the watch stopped recording. In this case that’s far enough in to see where things fall apart. We actually see a slight slowing earlier around ninety minutes in, at that point he still felt good, but early signs of problems are there. The two hour mark sees a shift, he starts taking walk breaks and the pace slows, then thirty minutes later the pace completely drops off. At that point he felt like his legs had nothing to give – empty. I suspect there is refinement to be made here – initial run pace could be lowered, although it felt easy and comparable to training runs, the heart rate might be higher than could be sustained. There’s nothing glaringly wrong throughout the day, no obvious point where he did the damage, perhaps it was an accumulation of small mistake, but nothing stands out from numerous successful races I’ve seen. As we discussed the issue and looked back over his training logs we started to wonder if there was another, simpler conclusion: perhaps he simply didn’t have the training to sustain that effort for an entire race. 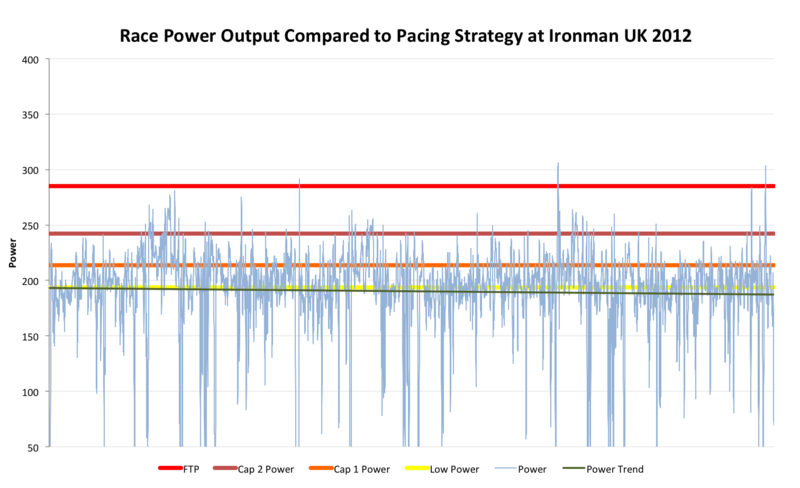 Weekly volume is typically around ten hours, something I’ve referred to as minimal Ironman training, and more notable is the dominance of cycling in the week. Partly my emphasis, partly the quirks of athletes that often favour one sport over another. Over time a deficit can accumulate in particular areas. He’s swim fit, he’s bike fit, but was he run fit to sustain a full Ironman marathon at that pace? Possibly not. On average he would run for around three hours per week, not enough – I suspect – to perform at his best after eight hours of racing. Theoretically the race was appropriately paced based on thresholds, what may have been missing was factoring for his volume of training; run targets should have been reduced due to lower run fitness. He should simply run more. Except, of course, there’s a reason he trains around ten hours per week – life. He can consistently manage ten hours per week, but there isn’t room to regularly do more. We started to discuss other options, perhaps specific run weeks within the schedule or my preference at this point in the year – with only Ironman Wales to go – is to do some specific run blocks over winter to help him develop run fitness. Biking has come on strongly, swimming has never been an issue, making running the focus for a few months could pay back strongly next season and not require him to step beyond those ten hours per week. Sometimes you simply need to run. Incidentally, I should add that despite the critique this was a personal best for the athlete in question; we just wanted more and it’s important to look at how we might improve on this result.